Behind the scenes… & Giveaway! Dear Friends, I hope you have had a great start to your week! First of all, I want to thank you all for your encouraging words on my Annie’s Learn to Machine Quilt class. Click on the Annie’s Online Classes on my blog sidebar to access the webpage of my Learn to Machine Quilt class. You look chic and metropolitan! What? You had a manicure, pink at that! For the video shoot, Amy the professional stylist extraordinaire wielded her make-up brushes and transformed my look into totally chic! How amazing is that? I was tempted to pack Amy in my suitcase to bring her home with me after the shoot was over. Back to the hair, it took me 3 washes to wash out the hairspray – you could probably guess-timate the amount of hairspray sprayed on my crown! I thought to myself at one point a basketball would have no problem or whatsoever bouncing off my hair! The video shoot took about 16 hours – two full grueling days of work for everyone involved. Now I have no problem speaking in public, but having to speak into a camera with a teleprompter outside of a classroom setting with no real audience, that took some getting use to. For a short while after I returned home, my mind would automatically switch to the “teleprompter” mode whenever I saw a string of words. I did work with some really nice people though, and we settled into a nice working rhythm that almost always went like this: “Wendy, give a big smile”, “I need you to do that with a smile”, “Could you do that again and smile?”, “Tug on your blouse, Wendy”, and “Smile!” etc. Lightheartedness aside, I would like to share with you a story. Quite a few years ago, there was a girl who didn’t dare to order something over the phone off of a catalog because she got nervous speaking English to a stranger, fearing that she wouldn’t be understood. It’s not that she didn’t know the language. She did, but just wasn’t comfortable speaking to strangers. So, her husband would always have to order. In time, she learned to be a bit bolder, and somehow stumbled herself into studying Chemical Engineering in Graduate School where she had the sole responsibility of calling about technical support on complicated equipment systems. She was also responsible in conducting various experiments that at times totally overwhelmed her. It was a time of personal growth where the girl learned to trust in God, and gain confidence in what she did. That girl is me. From one who didn’t dare to speak with strangers over the phone to one who felt extremely honored to be asked to do the class for Annie’s. This online class has definitely been a time of personal growth spurt for me, not to mention it being another Philippians 4:13 experience as well. I am thankful to God for the opportunities to grow in various stages of my life. And I want to take this opportunity to thank you all for your ever encouraging support. Now for the surprise I mentioned in last Friday’s post, you will be entered into a giveaway for a free “Learn to Machine Quilt” class between now and next Monday (11/12/2012) if you leave a comment about what other online quilting classes you would personally like to see – I would love to see specifics. You can still leave comments about anything related to the post content (PLEASE DO! ), but just won’t be entered into the giveaway if no suggestion about quilting classes is mentioned. Thanks for stopping by! Come back tomorrow if you want to catch a glimpse of a sewing machine used to make (some of) Queen Elizabeth’s outfits! This entry was posted in Quilting and tagged Annie's Online Quilting Classes, Learn to Machine Quilt, Machine Quilting, Wendy Sheppard. Bookmark the permalink. I loved your blog about your online quilting class especially the part about the stylist. We all should have one at home then we could look like the models in the magazines when we go to the grocery store! Your blog and instructions have made a significant impact on my machine quilting and I can’t thank you enough. If this latest venture doesn’t have instructions on your feathers, then hopefully your next one will. That would be great class to see! I need help with feathers and fillers mostly! I know for me when I quilt I always get stuck in a place and have to get out what to do do you tie a knot or do you do a few stitches in place. I find it hard to stay with a rhythm of stitching. It is because I can’t draw either. I can stipple but the leaves, feathers etc I never know what end to start. Hugs Bunny. I just loved your post and God has given you favor. Your very talented and I would also love to win your class. I would love to see more classes on feathers, and also not to sew myself into a corner and having to restart the many times I find myself in a corner. Just to have a rhythm, as Bunny suggested would be awesome. Thanks for the giveaway. I signed up last Friday night and couldn’t have been more pleased to be some of the first ones signed up for the class. It has been so much fun to get to know Wendy the last few months through the blog and the her magazines articles, and now to be taking her classes is just icing on the cake! I’m hoping tomorrow evening, I can sit down and start the lessons, I’ve listened to the first part of the video about getting ready and all things necessary but I just haven’t had time to do more. Can’t wait to see this “special” sewing machine! I would love to see a class dealing with thread tension and how to use different types of thread. Thanks for the giveaway. I just found your blog and at a great time, hehe. Enjoyed your post and learning how much goes into making the shows. I’m a beginner machine quilter and learning stippling. I’d love to learn feathers as well as continueous line, where two or three items are done to make a “picture”. Thank you for a neat giveaway and a chance to win. My comments are similar to the above, if you haven’t covered feathers extensively in this first class, that would be a great topic for another entire class! Though the designs I have the most problem with are the overall meandery types, like Jesters Hat, Swirly Swirls, those types. I can sort of see where to go next drawing on paper (sometimes) but once the fabric is under the machine, it’s a whole different story, perhaps because it’s the fabric moving rather than the pencil? Love what you do, Wendy. I’m always looking for unique background fills, can’t get enough of them. An added bonus for the class would be feathers. Thanks for sharing. Thank you for sharing your story about your experience shooting your new online class! I love your comment about trying to wash out the hairspray lol! I’m definitely going to be taking your course since you are my machine quilting Guru!!! I’d love to see a class on how to design a quilt or one to learn even more free motion quilting designs or one just specializing in mastering feathers! Thanks for the giveaway! I’ll be keeping my fingers and toes crossed! I am fairly new to machine quilting so any and all instructions are helpful but feathers are so pretty and a real challenge for me so help with those would be wonderful.Thanks for the chance to win . hi. great to see how well you are doing ..Always follow your fb and now this..What next? you do such great work.Think I would like to see more leaves in the quilting patterns.. such a variety and you could get many different designs…. thanks for all you do . also for the give away..
You look beautiful! I would like to see a quilting class on feathers as someone else mentioned. I think they are the most difficult and I quit almost as soon as I started. You look beautiful! I need help with feathers and a class on those would help me “feather my nest” much better I’m sure. Thanks! Thanks for your great instructions regarding machine quilting. Would really enjoy a class on how you decide on which quilting designs for a particular quilt. Always enjoy your feathers and fillers. I enjoyed your story and how much you have grown. I personally hate to use the phone. I will say that living in Samoa I was so fearful of saying their names wrong and was learning the language but so afraid to speak it ….so you amazing. And your giveaway…oh my stinking gosh!!!! Anyone would love to take your class. I would love a class on threads….. show and tell on different threads and what they can do and what works best and their effects of the quilting. I’d love to see another machine quilting class on how to quilt sashing and cornerstones. I really enjoy reading your blog…it’s very uplifting and inspiring. I’m guessing I’m twice your age…I’ve been a hand-quilter for over 35 years and am just now trying to master machine quilting. So little time…so many…well…you know. Anyway..thanks for lifting my spirit so many times. the quilt, to make it look professional all the way around. Thank you for the opportunity to take your class possibly. I could see the whole quilt then too. Hi Wendy! I think personal milestones are the best, since we know inside how long the road was to reach it. I would like to see a class regarding stitch length and control for those of us who cannot afford a sewing machine with a stitch regulator. I know that practice is important, but if you have tips to shear, I’d love to learn. Thanks so much for the time you spend sharing with all of us. I have learned so much and I appreciate the tips and hints so much. Your beautiful with or without makeup! I’d love to see a class on planning the quilting designs. What works well, what doesn’t. I would love an online class on doing embroidery or stitchery as it is called today. Congratulations on such personal growth! Awesome! Hi Wendy!! You look wonderful, and thanks for sharing your story about how your confidence has grown, it is inspirational to all of us with our fears. Along with all the other suggestions (feathers, sashing, binding…) I would love to see some examples of how to precisely match up points and intersections when piecing for perfect blocks! And how to fix mistakes…? I would love to take your class! I am like you when it comes to make up. I only wear it on special occasions. You look beautiful either way. Pink is definitely your color. Thanks for sharing your story. I am so excited for you. As far as other quilting videos, I think I would like something about how you or others come up with your own patterns. It is very complex to me. Wendy you look so chic. Was so happy to see that your teaching a class it is so much nicer to see everything on video. Was ready to sign up for your class but will wait with my fingers crossed to see what happens in the give away. It will be a long week. As for another class I would like to see feathers,beginner and advanced . Also, if you haven’t already batting and thread and the reason you pick them, Also, how do you really decide on what to quilt on your quilts. You have come a long way and have inspired a lot of people with your story. You know I can’t sew and don’t have a machine (so the classes are out for me), but I just want to tell you once again how very, very proud I am of you, Wendy! And makeup or not, you are beautiful to me because you are so beautiful on the inside. And you are also beautiful on the outside made doubly so by your inner glow of kindness. You are truly lovely, and I am so blessed to know you. And you are talented as can be. God broke the mold when he made you, my sweet, beautiful, smart, talented friend. I really loved readng your success story and how you gave the glory to the Lord. 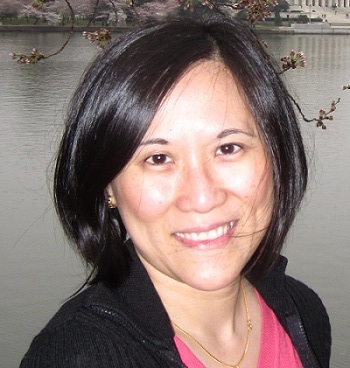 Wendy – Congratulations on your new class! So very excited for you — and you do look beautiful – with or without makeup. Thanks for sharing your very personal story. I would love to learn more about what to quilt to fill in an area — I sometimes look at a quilt design and go… “how do I break this up”… what pattern do I quilt where… I’m lost getting started on the design of the quilting. It would be great if you could share that with us in a class. Thanks and congratulations again ! I so much admire your work !! I’m so happy for you doing your online class! Congratulations!! I’d like a class on how to figure the overall quilting design. Your quilts are so beautiful, but for me to get from the finished quilt top to a beautifully quilted piece is a scary stretch. Thank you for your witness for the Lord. Trusting Him takes us places we’d never get otherwise! What a wonderful and hopeful post. Hope that oneday….. we all might be that super/superbly confident! I would love to see a quilt as you go tutorial, and well as instruction on how to quilt around appliques. I loved reading your post, and what a wonderful testimony you have! Our God is truly great. Congratulations on your latest endeavor! You are such a beautiful person, inside and out! I look forward to your posts! Thanks for sharing your life with us. I would love to learn about competition quilting…using the specialty threads and silk fabrics and learn more about what judges look for in competition quilting. Maybe less of the basics as there is a lot of that already out there. Oh yes, and it all has to be able to be done on a domestic machine for those of us who can’t afford the big investment in a long arm. I’m so glad I have signed up for your class. You look like the sweetheart I thought you to be! Thanks for the opportunity! I would love to learn about feathers as well! Great ideas! I would like ideas for which type of machine quilting would suit which block design. I find choosing what to quilt to be very tricky. Congratulations on getting your class done! You look great and it is fabulous that you found the courage to be confident! That is a message that everyone needs to hear now and then. As for the quilting class – feathers (both following a design and freestyle) would be fabulous. Also maybe a whole cloth quilting class, and quilting designs that are not stippling but don’t need marking to look pretty. Thanks for the giveaway chance! Loved reading your story of overcoming your fear and of God bringing you out of that space into a place where you can help others with your skills. Our daughter Katie does not like to talk to strangers, store employees, phone solicitors…she’s also come a long way. You are inspirational to me and so many others; your talent and your ability to teach well have touched more lives than you will ever know. I would love to see a class that explains how to plan your quilting, or, of course, feathers!! I think step by step your fabric, machine and you. How to machine quilt. Hi Wendy, congratulations on your taping and success. Good for you! Pushing ourselves is not easy to do, but essential for growth. You look so lovely! I’m glad you took the challenges and accepted the growth. You inspire me in so many ways. I love the flower design, and the jester you did for the FMQ challenge. I need to see more feathers and feathered wreaths. I’m still practicing them, but they don’t look as good as others I’ve seen. I need to see what I’m doing that needs improvement. Thanks! 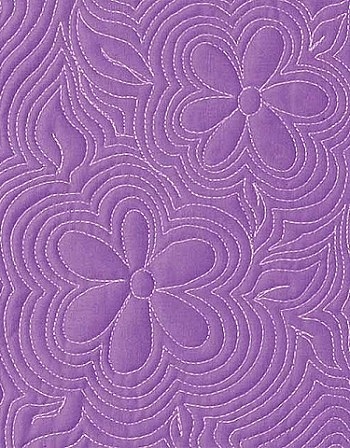 I’d love to see an online class of double-needle quilting. I was really amazed at some shots I saw a few months back of someone’s quilting with those. I’ve never used a double needle, but my machine does have one that came with it 3 years ago. . . so maybe I should find out how to use it and try it out! I would like to see a class on how to handle a larger quilt while trying to do FMQ using your home machine. I have a Designer I and I’m afraid that if I’m having trouble with a lap quilt how will I manage the King size that I am planning to make for our master bedroom. What magical things do I need to do to get it all under the arm of the machine??? Love your blog. I would love to see a class on dealing with a quilt that has a lot of applique on it. haha it just goes to show what a little make up and a can of hairspray can do to us girlies!!! I like the before look best though….Hmm new idea for a class, probably been done before somewhere on the web but I would like to see more of Fancy Feathers, you know the type, with flowers inside them or curlywhirly bits, not sure what you call them. Meantime though, absolutely anything that concerns FMQ is just great for me. I am learning so much from the WWW about this subject. from Jan across the Pond. I would love to see more applique or even English paper piecing classes. I will be signing up for your class Wendy..you have been inspiring me since I found your website some time ago. I’m changing my blogname from CathyC in Alberta to QuiltinGram as I am no longer living in Alberta. I moved back home to BC 5 days ago. It is very hard not to have my sewing room set-up so that I can sew. We are removing the carpet and putting down laminate flooring so if I somehow drop a pin it doesn’t get lost. This IS the class I would like to see online! Other than this, maybe a series of free motion quilting motifs for beginners on the home machine or a class on quilt as you go. Anything about machine quilting for dummies will interest me as I am a hand quilter who just purchased a super expensive machine complete with BSR and I have no idea how to begin! I’d also like to learn more about appliqué techniques by hand and/or machine. Congratulations on overcoming your fears! I would love to see a class on rotary cutting and getting accurate cuts. Also on how to use the different angles on the rulers (45 degree, 60 degree, etc.) A class on the different types of applique would be great too! Wendy, you are on your way. No one could be happier for you than I am. You know what I want to learn~~FEATHERS!!!!!! I would love to see you actually doing your quilting – feathers (as mentioned numerous times above), your pearl/circle fillers, as well as the quilting on your whole-cloth quilt. I have learned so much just from your drawings with Miss Baby’s crayons. I feel my quilting has grown along with you since following your blog. (“Muscles” are always painful to develop, even spiritual growth ones). I enjoyed reading your blog so much, You have grown and reach out with your talents. Thank you for sharing how your faith has given you the foundation for what you do. I am still a beginner at free motion quilting. I would like more instruction about how to decide what motif(s) to implement in my quilts. Congratulations on filming your class–what a great accomplishment. I need help with planning my quilting, especially on large negative spaces, so would love to see a class on planning/designing quilting patterns. block. Echo quilting sometimes has smaller room at the top of the block and I don’t know how to transition from small spaces to large. I am so excited for you. I couldn’t see the intro – figured there were too many of your followers trying to see it too! How exciting! You are a star! I am currently trying to learn paisley designs so I am interested in learning more about that. Your work is beautiful, Wendy! Your “jester’s hat” design is one of my favorites (although difficult for me, but I’ll keep practicing). I would love to learn more about quilting with specialty threads – silk, monofilament, metallic, etc. Oh Wendy, you look so beautiful! Love the color your wearing in the shoot, it really is your color. beauties. Or how to go about designing borders or what/how to quilt around hand embroidery. I would love to take your class because I havent done any FMQ yet. I guess I am scarred of it a little, I have some tops ready to quilt but after Christmas I will try your class. Thanks for the drawing. Girl, you look gorgeous – and congratulations on all of this, your hard work has paid off! I loved your story about not even being able to talk on the phone. God is good, all the time! Don’t enter me in your give-away, just wanted to say that I’m thrilled for you! I would agree with Karen, that a class that explains how you decide what quilting would look best on a quilt. I love to piece, but get very mystified by what to do for the quilting part. Thanks for your help and letting The Lord use you. I, too have trouble deciding what to quilt where, and would like to see a class on that. PS You look lovely. Congratulations on your class! The topic I would like to see covered is how to quilt tops with lots of pieced blocks that don’t have a lot of space for fillers. Also design ideas for borders. Why would you need makeup when you look so beautiful naturally? Congratulations on your wonderful success. It’s hard to imagine that you were ever that afraid of speaking. OMGosh…where to begin. I would love to know why you choose the type of thread that you do, more about adjusting tension on the machine, types of needles and why and then, of course, how to choose the perfect design for the quilt you are working on. How many years do we have???? I would like classes specifically for filling challenging spaces: triangles, narrow borders, etc, and for techniques such as cross hatching, and larger fill (as opposed to close fill). A class that I would find helpful is one about deciding what type of quilting to put in various parts of the quilt. Wendy, I too saw the clip and thought “what a chic chick” :-) I think you look great with and without the makeup and style. I think a great online class would be how to do hand applique. I think it is beautiful, but I’ve never tried it. Thanks so much for stopping by and leaving a comment on my blog. I always appreciate your comments. And YES We Can Do All Things through Christ! I have done your swirly flowers and jester’s hat, and have so enjoyed your help! THANK YOU! I would love to see a class on how to determine WHAT to quilt on a quilt top. Especially, the thought process you go through in coming up with your ideas. Girl! You look so GOOD!!! But then, I like you in the “plain Jane” picture too! Thank you so much for sharing such a personal story. I was very touched and it makes me that much happier for you to have the chance to be doing these classes – you’ll be so good at it – as long as you *smile* of course :*) I would be absolutely THRILLED to take an online class from you! You are my quilting idol – okay, we Christians don’t like that word LOL!!! I would love to see a quilting class focusing on clothing, accessories and home decor. Great blog post!! When I first saw the picture, I did a double-take, but when I listened to the Introduction clip and heard your voice, it was the same sweet, caring Wendy I’ve always known!! I’m so happy for you and your accomplishments. Amazing blessings to a truly deserving person! I’d like to see an online class on feathers. I know I’ve taken your class in person and love all of your tutorials but an online class would be nice to go back and refer to when I need help (which is often)!! Thanks for sharing your knowledge! Hugs! What a blessing this opportunity is for you, and how lucky we are to get to benefit from it! I would love to see a lesson on quilting unusual shapes. I’ve been doing a lot of paper-pieced pointy stars, and am struggling with how I will quilt all those spikes. The projects are ones that I’ve spent a lot of hours (months!) putting together, and just throwing an all-over design on them just wouildn’t do them justice. Your quilting class looks so interesting – I would love to see a video on different types of filler stitches and how to balance a variety of stitches throughout the quilt. Thanks! I LOVE your blog and hadn’t read it before and don’t even remember how I found it but I am so happy I did. You are super confident gorgeous young woman either way – with or without make-up. I have purchased so many classes from Craftsy but no FMQ classes for complete beginners and this one looks like it would be right up my street – a terrified beginner. What other kind of class would I like to see? Ummm a Quilt As You Go class that would teach me how to join the blocks without having to put sashing in between the blocks as I’m not a big fan of sashing. Is this even possible? Thank you so much for the chance to win this one but if I don’t win it well …. Congratulations on your new venture. I would defu=initely like an on line class on your method of making feathers and also tips on using the bSR. You had me in tears with your story. Your courage and faith is a gift we can all share. Thanks so much. I’ve taken quite a few free motion quilting classes and always seem to get something new out of them. I love new designs but my biggest problem is still controlling quilts when they’re over 60″ square. Not letting them slip or ‘seeing’ the design (working a small area on a big quilt design). Controlling stitch quality. Thanks for the give away. Crossing my fingers here. I would like to see other motifs, how to quilt them and or how to transition from one motif to another smoothly. I was very shy as a child and even through high school but when I went to college I decided I was tired of being shy so made myself speak up. I figured no one knew me and knew I was always the shy girl so decided to just go for it. Was hard at the beginning but now my friends don’t believe me when I tell them I used to be very shy as I am quite the talker now. Glad you got over your reticence about talking to strangers too. I would love to see a class on hand piecing a quilt. I love your story of conquering the language barrier. You have such a dear heart & attitude of gratefulness in your life. I’m excited for this teaching opportunity for you. I wish you lots of enjoyment as you do this. I really love all your beautiful free motion quilting. It is still a struggle for me. Sometimes I think I am getting better at it and then I go backwards. I think learning more about the correct needles and thread to use might be helpful. There’s so much to learn about the many kinds of thread. I just want to see beautiful stitches and that is difficult for me. It is also difficult to relax while free motion quilting and and I understand that is supposed to help. Keep up your beautiful stitching! Wendy, you have always inspired me to challenge myself to do more free motion quilting. I admire you for going headlong into a country whose mother tongue is not your own. I salute you. I would love to see more of what you have to teach as well as other experts in the field. I am often stumped as to what to quilt in a border, so perhaps a class of quilting sashings and borders would be great. What a great “behind the scenes”! What fun it was hearing – and seeing – all about it! And, you look lovely with or without make-up! o:) The dress is stunning. Lovely personal story too – so glad you have gotten the confidence you deserve! I would love to see a quilting class on feathers – they are always a bug – and very scary, I think! I would love to have more confidence in attempting them! I had to do a double take when I got this. I didn’t know if it was you are not. Look good either way. I’m so glad I got to take classes in person with you. You have taught me a lot about the feathers. They still are not easy for me but I’m sure I will learn if I continue to work on it. I just never think my stuff is good enough. God blessed you with a lot of talent and I’m glad you share what you learn through your teachings. Miss ya. I would really like to see some classes on several different binding techniques and lots of helpful tips about quilting in general. I need a very basic quilting class. I need hints on how to control the machine with free motion quilting. (or should i say fabric). My movements are jerky not smooth. I haven’t tryed any of annies classes yet. Would love to win one to check them out. I would also like to see a class on English Paper Peicing. I have a UFO on that. Wendy, I don’t remember how I came upon your blog last year about this time…that’s when I started quilting. You are my favorite quilter/blogger and an inspiration to all who visit here! You are a master quilter teacher and I love how you don’t hesitate to share your God-given gifts with us. I cannot wait to take your class! I would love to see a class on applique. I also loved your bon bon and candy quilt and would love to learn how to add depth and texture to future quilts. I just love all your feathers and variations. So enjoy your blog. Can’t get enough of your hints and helps! Thanks! Wow! Loved your sharing of the behind the scenes……so cool to see what goes on to create such cool lessons! Thanks! I would like to see a class on the different techniques of applique. Since I’ve been following your blog for quite sometime I think it’s such a great opportunity to watch you quilt and learn more from you. I would also like an applique class and also a class on binding a quilt, particularly curves. Thanks for the opportunity to win the class, but I put it on my Christmas wishlist anyhow! lol! Your the best Wendy! I have been doing some free motion quilting on my home sewing machine and LOVE it…I guess you could say I am a little obsessed! BUT…I am wishing that I felt more artistic and confident in quilting my own free hand designs…without stencils or patterns. I would love a class that teaches some beautiful designs I could just sit down and quilt myself. Enjoy your hints and helps! Thanks! I loved seeing these “behind the scenes” peeks and hearing how the Lord has stretched out out of your comfort zone. That’s encouraging to me because I tend to resist that stretching. The other things I’d like to see are ways of dealing with a quilt sandwich if you don’t have one of those big quilt frames and you’re wrestling with it by yourself. EU GOSTARIA DE UMA AULA SOBRE QUE MATERIAIS USAR PARA FAZER QUILT. POIS A ABUNDÂNCIA DE MATERIAIS É PEQUENA AQUI NO BRASIL…POR ISSO VEJO OS TUTORIAIS ..AI ..NÃO ENCONTRO MATERIAIS SEMELHANTES..SERI INTERESSANTE LISTA DE MATERIAIS ALTERNATIVOS PARA OUTROS PAÍSES…EX: BRASIL E SE VOCÊ QUISER POSSO AJUDAR.. I would really like a class on how to quilt landscapes. Mountains rivers ocean trees etc. That is what I am really interested in. Hints and tips about getting started with machine quilting. Equipment needed, how to set it up and just generally getting going. Once I can started, i might be OK. I love on line tutorials on free motion quilting, and I love learning new techniques. I would also like to learn how to incorporate machine embroidery into quilts, thanks! I can FMQ loops and stars and swirls but am having a heck of a time with meandering!! HELP!! I would also like to learn feathers and flowers. I sew need help! I would love to see more on free motion quilting techniques & perhaps some applique quilting. Great to read about all of the work that goes into filming. Love the story of your videotaping experience! Would live to see a class discussing thread types and weights, mixing different colors on top and bottom, and the different needle sizes used with different thread sizes. Thank you! Thanks for this giveaway. I would love help with deciding which designs to use in which places in a quilt. I really want to learn machine quilting! I have never done it so a class would be great! And as far as a future class I think any of the suggestions from these quilters would be great! Thank you for the opportunity to win this class. Good morning! I would like to learn how to quilt in half-circles or rainbow shaped. Thanks for the opportunity to enter the contest. I would like to see FMQ class on just borders. appropriate for the style of quilt, modern, traditional, etc. Also best for all over prints or solid colors. I have quilted for about 10 years and am tired of stitch in the ditch! I need to learn something I can do with quilts with a REGULAR sewing machine. I would love to see techniques on how to get to the middle of the quilt and sewing! Also I would love to learn how to quilt on the border. I came for a visit after seeing your giveaway on Craft Gossip…..I loved your post. 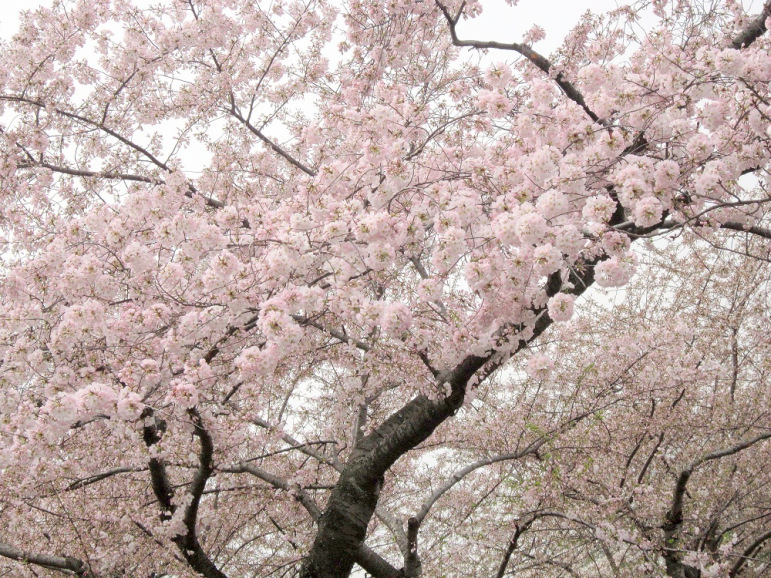 The visual of the budding/blooming tree was very effective as an illustration of your growth. I love it when we can look back and see where we were guided along life’s journey to where we are today. I am new to machine quilting…..I would love to see free motion quilting with a bit of marked guidelines….also how do you decide on the motif/pattern you will use for the quilting. What makes a good design? The little I have tried machine quilting, I ended up with lumpy stitching. How do you keep everything in place while quilting. Could you take one motif and change it up so it is suitable for an entire quilt? Using different thread colors for the quilting and how those colors affect the design. Thanks to Craft Gossip for featuring you, now I have a new place to follow. I see the Craft Gossip and find your giveaway. I am new in quilt things, so I really interesting in the class. HOW to start/end those great concentric designs so you don’t have obvious double stitch lines. how are you actually marking your quilt top for those feather designs? I’ve tried chalk–messy and it rubs away. Marking pens? takes too long. freeform? I don’t know when to stop. how to choose the color of quilting thread–should the top and bottom be the same color? I’ve always been afraid of bright colors because I figure it would highlight my less-than-perfect stitching. thanks for letting me vent! I’d love to win a spot in one of your classes. I just learned about your website and hope to learn more. I am intersted in feather quilting, echo quilting, and free motion designs that are more than meandering. Thanks! 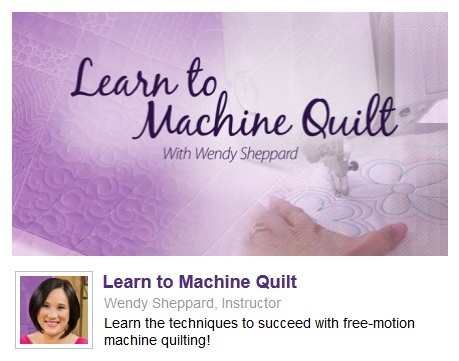 Your video on machine quilting looks wonderful! I have some free motion experience (self taught, so I could really use a class to improve my skills), but I find I stitch myself into corners a lot. I also don’t mark designs or registration points or anything like that because I don’t know how to go about doing that. I would love some instruction on those aspects of the quilting process. Thanks for the generous giveaway. The things I need help with are: planning the machine quilting so I don’t end up going back towards the centre of the quilt, whereupon I almost always get a pucker in the backing fabric, and secondly, i seem to get into a nice rhythm only to find I have loose stitching underneath on the curves. Maybe you cover these in your new course? Thank You for sharing that story. My biggest problem with FMQ on my little sewing machine is the (bobbin) stitch tension, It is so discouraging. So a CLASS on stitch tension would be helpful. Thank You. My story about hairspray: I was working in a clinic doing massage. I think it is important to work on the neck and head so I always asked if it was OK to put my (greasy) hands in their hair. They could have a shower after or I could use a towel but it was their choice. One woman had hair that stuck up in a pattern and when I asked her, she said it was fine as she had used so much hair spray over the past week that it wouldn’t matter. She was correct. Her hair was as solid as a helmet and it stayed in its pattern! You look wonderful, and I think it’s great how much you’ve grown! I would love to see a quilting class that combines art with quilting, like painting a picture with cloth and thread. I would love a class on deciding where to quilt what. Feathers on Borders? Stipples put where. I just never know what to quilt where so instead of practicing I end up in the ditch. My daughter is a feather fanatic and I would love to make her a quilt that is as special as she is, so a class on feathers would be just wonderful. What I need is help deciding what to quilt where. I think that would be a great class. There must be some guidelines that you go by or at least some suggestions. Everyone needs help with this so I think it would be a good class. This class looks great! I would love to learn more about creating the patterns for different quilts. You look lovely either way, homey or chic! As for FMQ, being mainly self taught, hearing problems are very restrictive in class, the finer points on balancing designs and also fiting feathers in the borders would be helpful. I must admit I still get lost on fillers by quilting into dead-ends, hopeless at stippling, but am quilting acceptable feathers which are what I love the most. My brain automatically plans custom quilting but would love to have a go at all-over quilting but I am frightened of that dead-end problem. I would love to see a beginners quilt-a-long. For example, a baby quilt. Day 1 could be choosing material, fabric requirements and supplies – you could include pictures or a video clip in a fabric store. Day 2 would be cutting and piecing together, day 3 – sewing your pieces together and trimming the quilt to get it ready for binding, day 4 – binding, day 5 – machine quilting! And maybe a tutorial for those who would want to hand quilt their baby blanket? I think it would be perfect to get brand new quilters hooked! I can’t wait to take part in your class! Your work is lovely professional. I am a textile designer and used to travel overseas for work but I never got to see the process. I am disabled now due to severe arthritis and would LOVE to learn machine quilting to use for scrapbooking. Thanks for being here and sharing your expertise! Blessings to you! I would like some hints on keeping free motion designs relatively the same size. Is there a secret to keeping the design balanced over the whold quilt? Your class sounds interesting. I have blogged yet, because I haven’t yet to do idt. But hearing the first lesson is the class, I am really excited tho get started. I have so many projects, I don’t know what to yet. Well that’s not quite true. I have making 6 or sevemt table runners tow. I will get back to you as soon as I can. I like your blog. how quilting diferent motifs I like to see online quilting classes.